DOT Art partners with community-based, nonprofit organizations and professional artists to present temporary public artwork on DOT property throughout the five boroughs for up to 11 months. Artists transform streets with colorful murals, dynamic projections and eye-catching sculptures. Sidewalks, fences, triangles, medians, bridges, jersey barriers, step streets, public plazas and pedestrianized spaces serve as canvases and foundations for temporary art. 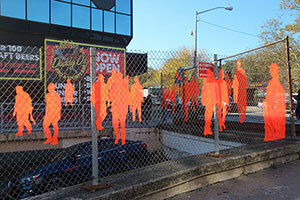 Over the past 11 years, DOT Art has produced over 300 temporary artworks citywide. Artists are eligible to receive funding for artwork commissioned annually through our signature program, Community Commissions, as well as Special Project open calls announced in conjunction with high priority agency initiatives. Organizations are also invited to present artwork in partnership with an artist that is fully funded on self-selected DOT sites through the Arterventions program. DOT Art works closely with all organizations and artists to transform the streets from ordinary to extraordinary with artwork. The Song of Dragon and Flowers 2018 by Chinatown Partnership, Fou Gallery, Art Bridge & Chen Dongfan. Presented with DOT Public Spaces. Seasonal Street: Doyers Street, between Bowery and Pell Streets, Manhattan. 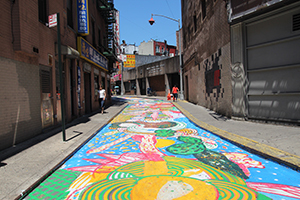 Artists are invited to submit design proposals in response to the 2019 Chinatown Asphalt Art Activations open call. DOT Art is partnering with DOT Public Spaces and the Chinatown Partnership to commission mural designs to be painted onto asphalt street spaces on Doyers Street and Mott Street as part of the Chinatown Seasonal Streets initiative in Lower Manhattan. Seasonal Streets are temporary transformations of streets into vibrant public spaces for pedestrians. DOT Art aims to highlight the transformation of our infrastructure by inviting artists to envision asphalt surfaces as canvases for art. 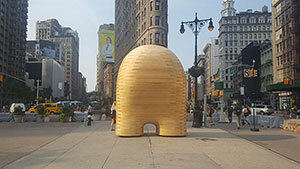 Selected artists will be awarded up to $10,000 to implement their design in July 2019. Submit an application via email to arts@dot.nyc.gov by 11:59 PM EST on Wednesday, May 22nd, 2019. Explore current temporary installations using our engaging map as your guide. Download the DOT Art Current Project Map (PDF). Through its signature program Community Commissions, DOT Art collaborates with community-based, nonprofit organizations to commission artists to design and install temporary artwork on DOT property that remains installed for 11 months. Each year, DOT Art releases an open call to solicit site ideas from community organizations and selects up to five priority sites to host artwork in partnership with those organizations. Artists are then invited to submit concepts in response to those priority sites through a formal open call. Selected artists are eligible to receive up to $20,000 towards project costs in addition to engineering support to fabricate and install the artwork. Partner organizations collaborate with DOT Art and the selected artists throughout the project phases, and must agree to maintain the artwork and remediate the site upon completion of the display period. DOT Art pursues unique project sites across all five boroughs, and explores new ways to collaborate with a diverse body of artists each year. I am Here at Bay Street and Victory Boulevard, Staten Island by Harumi Ori. Presented with Staten Island MakerSpace. Bay Street and Victory Boulevard, Staten Island. On an ongoing basis, DOT Art commissions temporary artwork in conjunction with high-priority agency initiatives that remain installed for up to 11 months at a given site. Sites and artwork types are proactivity identified and announced by DOT Art in response to annual requests gathered from DOT Borough Offices and Operating Units. Artists are eligible to submit temporary art proposals in response to specific open calls released throughout the year. Funding opportunities range from $2,500 to $20,000 dependent on project type and scale. DOT works with selected artists to maintain the artwork and remediate the sites upon completion of the display periods. DOT Art partners with galleries, arts and community organizations and business improvement districts to install existing or new artwork that is fully funded by the organization on self-selected DOT sites. Artwork typically remains on display for 3 to 6 months with a maximum period of 11 months. Proposals are typically associated with an exhibition on view in a neighboring gallery, or an artwork that has been produced in conjunction with a local festival. Interested organizations and artists must submit a joint application. Organizations are responsible for engineering review, artwork maintenance during the display period and site remediation upon completion of removal. DOT Art issues a list of example sites each year to provide direction to interested organizations and artists, and Site Selection Guidelines are also available as a resource when considering potential sites. Organizations are encouraged to email DOT Art to confirm site ownership in advance of submission. Applications are accepted on a rolling basis but must be submitted at a minimum of 90 days in advance of the proposed installation date. Organizations should contact DOT Art as soon as possible if interested in presenting multiple works at a given time as part of an event or larger exhibition to ensure that the project deadline is attainable.